For other uses, see WEM. The name of the town is derived from the Old English wamm, meaning a marsh, as marshy land exists in the area of the town. Over time, this was corrupted to form "Wem". The area now known as Wem is believed to have been settled prior to the Roman Conquest of Britain, by the Cornovii, Celtic Iron Age settlers. 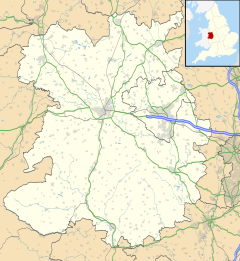 The town is recorded in the Domesday Book as consisting of four manors in the hundred of Hodnet. In 1202, Wem became a market town. From the 12th century revisions to the hundreds of Shropshire, Wem was within the North Division of Bradford Hundred until the end of the 19th century. The Domesday Book records that Wem was held by William Pantulf, First Lord of Wem, from Earl Roger. The town supported the Parliamentarians in the English Civil War, and was subject to an attack by Lord Capel, in which the town held off the attackers. In 1677, a fire destroyed many of the wooden buildings in the town. Within the town the sweet pea was first commercially cultivated, under the variety named Eckford Sweet Pea, after its inventor, nursery-man Henry Eckford. He first introduced a variety of the sweet pea in 1882, and set up in Wem in 1888, developing and producing many more varieties. There is a road to signify the Eckford name, called Eckford Park (within Wem). Each year, the Eckford Sweet Pea Society of Wem hold a sweet pea festival. In Victorian times, the town was known as "Wem, where the sweet peas grow". Wem was struck by an F1/T2 tornado on 23 November 1981, as part of the record-breaking nationwide tornado outbreak on that day. More recently, it has been popularly known as the siting of the so-called Wem ghost. In 1995 an amateur photographer photographed a blaze which destroyed Wem Town Hall; the photo appeared to show the ghostly figure of a young female in a window of the burning building, dressed in 'old-fashioned' clothes. Although the photographer (who died in 2005) denied forgery, after his death it was suggested that the girl in his photo bore a 'striking similarity' with one in a postcard of the town from 1922. Wem was historically the centre of a large parish, which became a civil parish in 1866. In 1900 the outer parts of the parish were separated to form the civil parish of Wem Rural, and the town itself became the civil parish of Wem Urban, coextensive with Wem Urban District. In 1967 the urban district was abolished and became part of North Shropshire Rural District. From 1974 to 2009 it was part of North Shropshire district. The parish council of Wem Urban has exercised its right to call itself a town council. The electoral ward of Wem for the purposes of elections to Shropshire Council also covers part of Wem Rural parish. The population of this ward at the 2011 Census was 8,234. Since 1978, Wem has been twinned with Fismes in France, after which is named a road in Wem, Fismes Way. The River Roden flows to the south of the town. The Shropshire Way long distance waymarked path passes through Wem. Wem's main church is the Anglican Parish Church of St. Peter and St. Paul. Within the town there are four main churches. The oldest of these is the Anglican Parish Church of St. Peter & St. Paul. The other three are Baptist, Methodist and Roman Catholic. Thomas Adams School is a state-funded secondary school, established in 1650. It also has a Sixth Form College on site. Each year Wem holds a traditional town carnival on the first Saturday of September, as well as the Sweet Pea Festival on the third weekend of July. Wem Vehicles of Interest Rally & Grand Parade also runs along side the Sweet Pea Festival on the Sunday. Wem was the fiefdom of Judge Jeffreys (1645–1689), known as the "hanging judge" for his willingness to impose capital punishment on supporters of the Duke of Monmouth. His seat was Lowe Hall at The Lowe, Wem. In 1683 he was made Baron Jeffreys of Wem. Wem's main claim to fame is that it was the childhood home of one of England's greatest essayists and critics, William Hazlitt (1778–1830). Hazlitt's father moved their family there when William was just a child. Hazlitt senior became the Unitarian Minister in the town occupying a building on Noble Street that still stands. In 2008 the town held a 230th Anniversary Celebration of Hazlitt's Life and work for five days, hosted by author Edouard d'Araille who gave series of talks and conference about 'William of Wem'. William Hazlitt moved away from Wem in later life and ultimately died in London. In 1940 Anna Essinger (1879–1960), a German Jewish educator, evacuated  her boarding school, Bunce Court School from Otterden, in Kent to Trench Hall, near Wem. She facilitated Kindertransport. Sir Thomas Adams, 1st Baronet (1586 in Wem – 1667/1668) Lord Mayor of the City of London  and MP for the City of London from 1654–1655 and 1656–1658. Edward Whalley-Tooker (1863 in Wem – 1940) cricketer,  played for Hampshire. ^ a b c "History of Wem". Wem. Retrieved 2 July 2008. ^ Powell-Smith, Anna. "Wem - Domesday Book". ^ "Bradford Hundred - British History Online". ^ Woodward, Iris (1976). The Story of Wem and its Neighbourhood. Wilding's, Shrewsbury. p. 18. Gough's book was not published until the 19th century. ^ Kelly's Directory of Shropshire. Kelly's. 1900. pp. 269, 333. ^ Kelly's Directory of Shropshire. Kelly's. 1895. pp. 253, 312. ^ Woodward, Iris. The Story of Wem and its Neighbourhood. p. 114. ^ "End of Era for Brewery". Shropshire Star. 22 July 1987. ^ "Shrewsbury Town - Historical Football Kits". ^ "Ghost picture mystery resolved". ^ "Has the mystery of the 'Wem Ghost' photograph finally been solved? - The Times". ^ "Wem Rural CP through time - Census tables with data for the Parish-level Unit". ^ "Ward population 2011". Retrieved 1 December 2015. ^ "Wem Churches near Shrewsbury, Shropshire". ^ "Wem". Shropshire Routes to Roots. Retrieved 2 July 2008. ^ "TV Comedy People: Peter Jones". British TV Resources. Retrieved 2 July 2008. Wikimedia Commons has media related to Wem. Wikivoyage has a travel guide for Wem.